Brian Howard’s 1983 opera is given a stunning, large-scale production with a highly talented all-Australian cast. 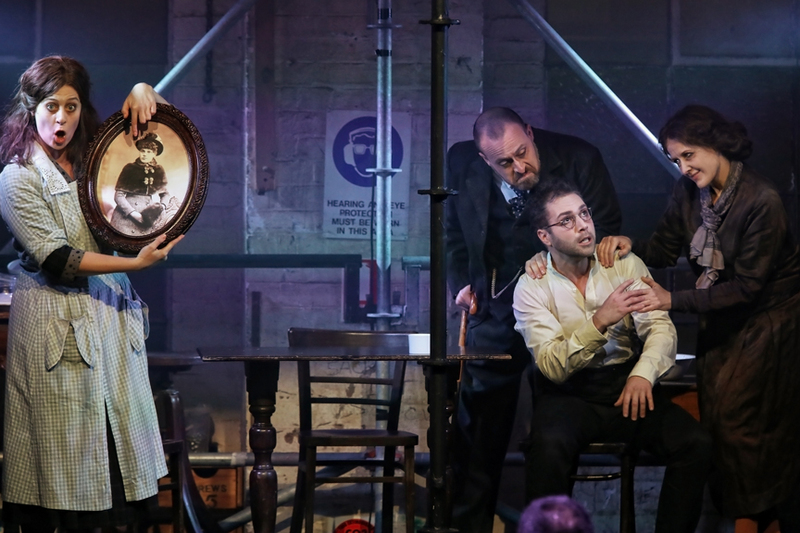 While audiences are bound to feel a sense of unease while watching Metamorphosis, spellbinding direction and finely honed musicality will draw tremendous admiration for the quality of the production. With one of the most famous opening lines in all of literature, Franz Kafka’s 1915 novella has inspired multiple adaptions in a range of forms. The opera begins, as does the novella, with Gregor Samsa awakening from a night of uneasy dreams, finding that he has transformed during the night into a giant insect. Working from a libretto by Steven Berkoff, adapted from his play, Howard composed a tight chamber opera for six singers. Gregor’s parents and sister, reliant on his work as a salesman, must learn to cope with the change in his appearance just as Gregor must learn to move, sleep and eat with his new body. The demanding Chief Clerk and the truculent lodger round out the company. Sung in English with no need of surtitles, Howard’s composing style keeps syllables crisp and clear, allowing for a strong focus on acting in addition to singing. Conductor Paul Fitzsimon maintains careful control over thirteen very well-rehearsed soloists from Orchestra Victoria, also giving clear guidance to the singers. The result is a well-integrated musical performance, the quality of which belies any level of fiendish difficulties. Director Tama Matheson helms a fascinating, darkly textured performance, the effect of which is closely connected to the production design. A level of tension is established almost instantly, and this basically never lets up for the 105 minute running time. If there is an occasional laugh to break the tension, it derives from only the blackest of pitch black comedy. 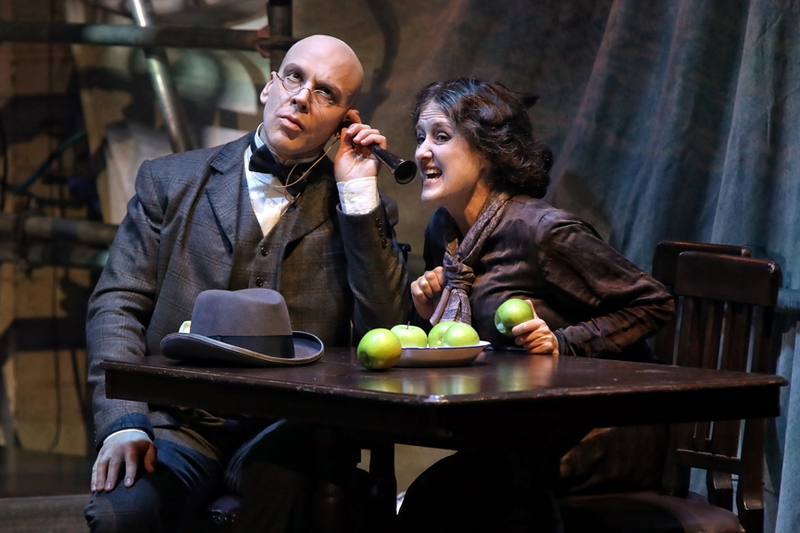 Working closely with lighting designer John Rayment, set and costume designer Mark Thompson has created the sepia-toned effect of an old photograph come to life. 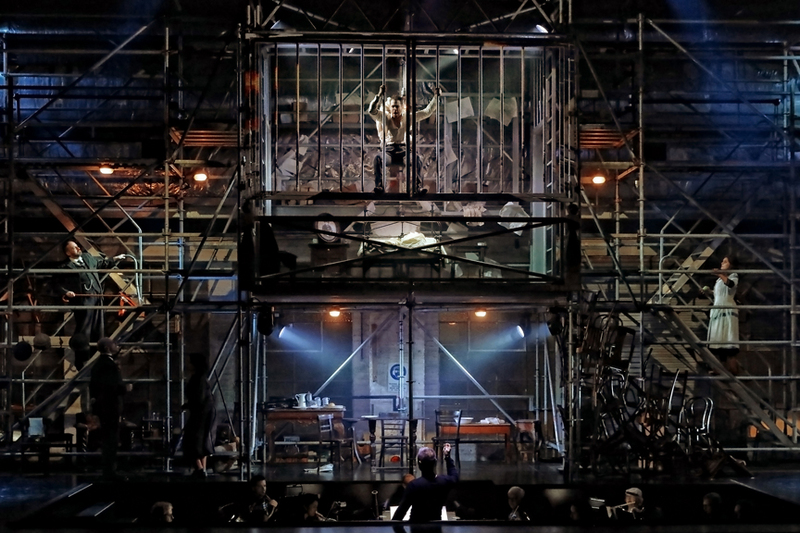 A terrific fit for the proscenium-free Merlyn Theatre, the towering production features an intricate construction of scaffolding, platforms and stairs, with minor items of furniture establishing the rooms in the Samsa home. Vast hanging sheets on each side of stage carry shadowed projections of teeming beetles and spiders, keeping an infestation of creepy crawlies ever present in one’s peripheral vision while watching the main action. The Chief Clerk and the Lodger provide additional human presence by sitting high overhead between their featured scenes. 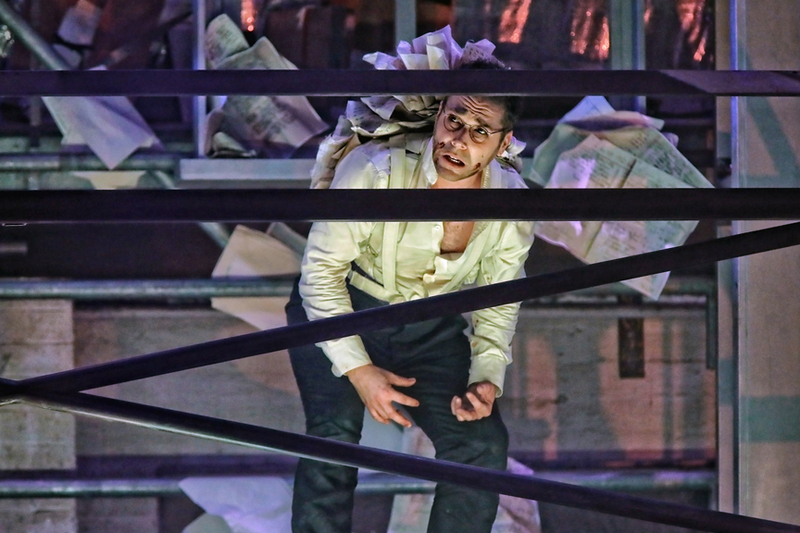 Simon Lobelson gives an extraordinary performance as Gregor, singing with steely, focused power and expending unbridled physical energy in the highly demanding role. 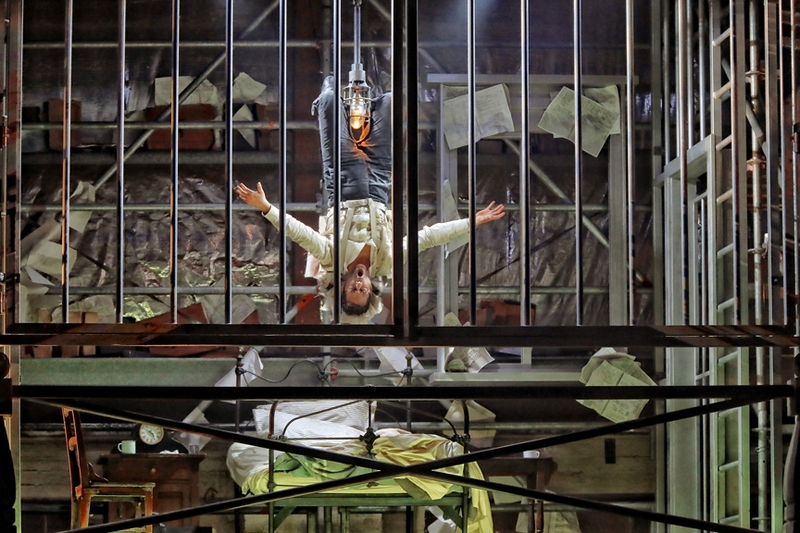 Gregor spends much time in his room, where Matheson has Lobelson climb and crawl about the place, even singing while hanging upside down in one amazing sequence. With just a fluttered piece of costume for his back, Lobelson conveys the transformation through his physicalisation, also clearly demonstrating Gregor’s horror and impotence at the all-consuming change. Largely unsympathetic, Gregor’s family reacts fearfully to his transformation, with any potential compassion largely stifled by a driving sense of self-preservation. In a very welcome stage appearance, Taryn Fiebig draws on her talents as a highly expressive actress to colour her lovely soprano with layers of emotion. Fiebig shows Mother’s kindness to be coming from the insular world of a woman who is denying the truth before her eyes. Baritone Christopher Hillier captures Father’s surly self-possession, tempering the unpleasant character with a well-judged touch of comic countenance. Julie Lea Goodwin dresses down as ghoulish sister Greta, contrasting her morbid appearance with reliably charming vocals. The end of the story sees Mother and Father notice that Greta’s beauty has begun to blossom. In an inspired touch, Thompson has Goodwin, as Greta, make a chrysalis-like costume change in which she takes off her dull outer smock to reveals a smarter dress underneath. Adrian Tamburini expertly portrays the rigid determination of the Chief Clerk, later making for a sinister exterminator. In bright voice, Benjamin Rasheed gives the stage energy a lift with his late arrival as the intractable Lodger, an amalgam of three lodgers in the novella. Metamorphosis is a major production, and one that imparts a far more thrilling effect than the latest return of a chocolate box favourite. Adventurous opera lovers are strongly encouraged to attend. 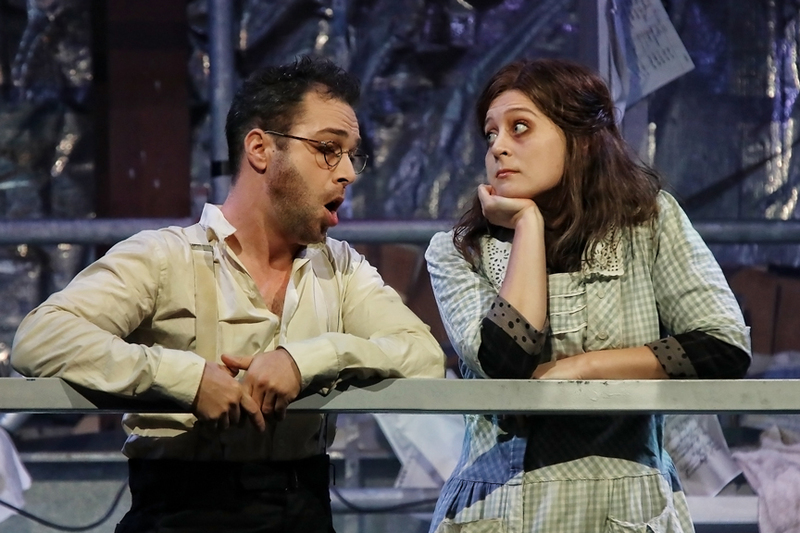 Metamorphosis plays at Merlyn Theatre, The Malthouse, Melbourne until 27 October 2018.